Craig Snow and Noel Hoke burn the mortgage at the Winona Lake, Ind., Grace Brethren Church on Sunday. 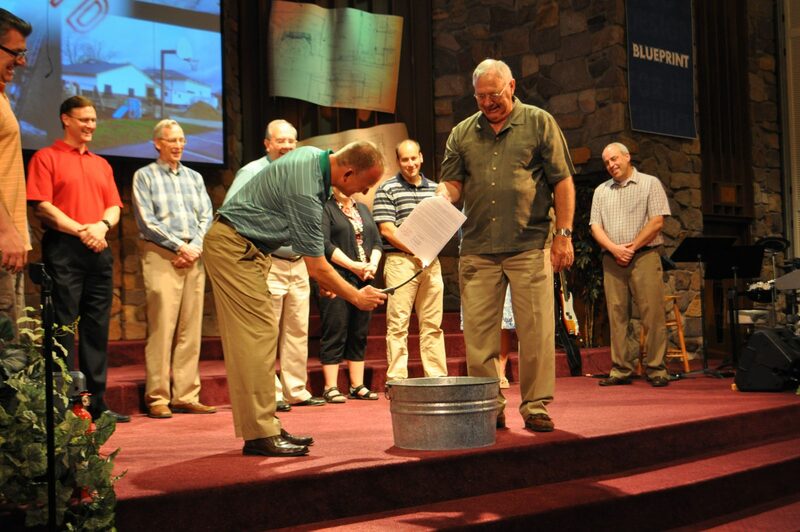 Members, attenders, and staff of the Winona Lake, Ind., Grace Brethren Church (WLGBC) celebrated in all three services yesterday (June 2) as it was announced that the mortgage on the church’s buildings has been paid off. The mortgage was burned during services in the main sanctuary and in the Living Room, which meets at The Hub, the youth center and community building at WLGBC. The paid-in-full mortgage was actually a compilation of financing for four different building projects going back to the construction of the original facility in 1968. Other building projects since then include adding the wing that includes children’s classrooms, enclosing the courtyard, adding office space, and construction of The Hub. 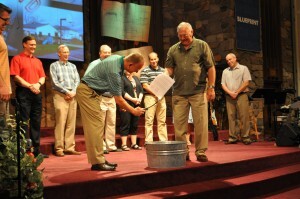 At the 8:45 a.m. service in the main sanctuary, Craig Snow and Noel Hoke had the honors of burning the mortgage. They were joined on the platform by a number of trustees, overseers, and members of the Business Commission of the church. The church is located at 1200 Kings Highway in Winona Lake.